Opening Nov. 9 in New York City’s Westwood Gallery is Pacific to Atlantic: Contemporary Artists from Hawai‘i, an exhibition showcasing 13 artists who are either based in Hawai‘i or have ties to the islands, and most have had work shown at the Honolulu Museum of Art. So if you’re in Manhattan between now and Dec. 28, head to the Bowery to see work by some of your favorite artists. We’re especially proud that Aaron Padilla, our director of learning and engagement, and Taiji Terasaki, a museum trustee, are included in the mix. 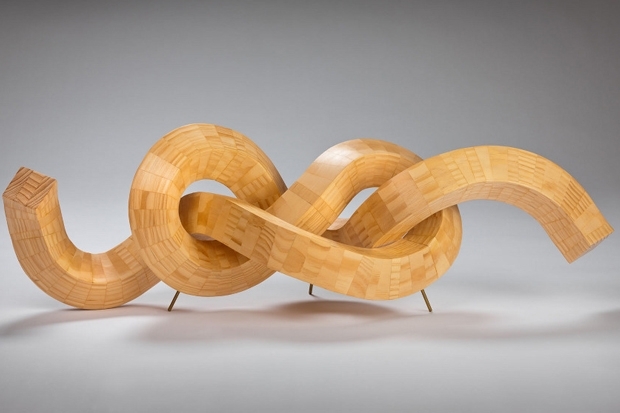 Padilla’s sculpture Figure Eight (pictured above), featuring his trademark technique that makes wood seem as pliable as a silk ribbon, will be on view. Terasaki, who has work now on view in the Curitiba Biennial, will have photographs from his Feeding the Immortals series in the show. 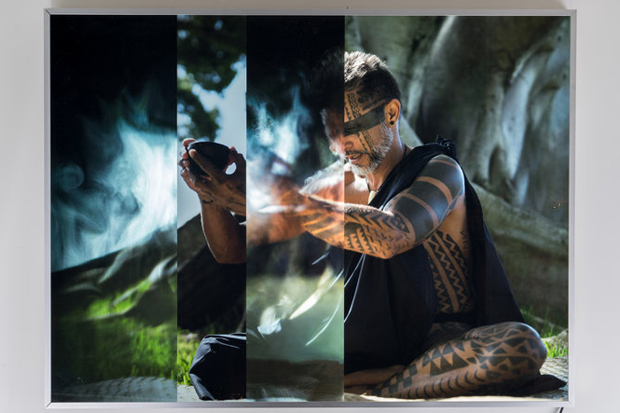 “Tattoo High Priest: Kahuna Ka Uhi Keli`’lokalani Makua Performs Kava Ceremony,” 2017, lightbox. The other artists in the show are: Andrew Binkley, Gaye Chan, Kaili Chun, Solomon Enos, Charlton Kupaa Hee, John Koga, Kapulani Landgraf, Jane Chang Mi, Aurora Robson, Lawrence Seward, and Peter Shaindlin. The owners of Westwood Gallery, James Cavello and Margarite Almeida, are also the organizers of the Art Hawaii International Contemporary and Modern Art Fair, slated to make its debut at the Hawai‘i Convention Center in one year. Fantastic! Congratulations to the artist! Congratulations to all of our astounding Hawai‘i artists! What a wonderful contribution to the New York art scene. Well done.